Mark's Tickets is the best place to find tickets for San Francisco 49ers fans. Just check this page for any new events or schedule updates throughout the year. We sell tickets to every San Francisco 49ers game around the world. 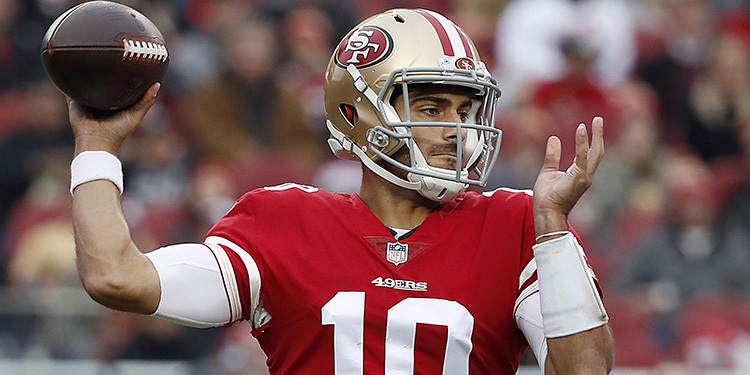 We know how passionate San Francisco 49ers fans can be about football, so we make sure to have hundreds of tickets for every game available right up until it starts. For those looking for cheap San Francisco 49ers tickets, we offer tickets starting at very low prices (many times below face value). We offer tickets in most sections of every venue that you can see San Francisco 49ers. Simply choose the city or venue that you are interested in below, and you will be able to see all of the available seats. Do not forget that Marks Tickets also specializes in sold out San Francisco 49ers tickets. No longer will sold out shows prevent you from seeing San Francisco 49ers. The San Francisco 49ers are a professional football team that plays in the NFL. The 49ers play their home games at Candlestick Park in San Francisco, California. With 16 games per year, and 8 being home games, The San Francisco 49ers are a professional American football team based in San Francisco, California, playing in the West Division of the National Football Conference (NFC) in the National Football League (NFL). The team was founded in 1946 as a charter member of the All-America Football Conference (AAFC) and joined the NFL in 1949 after the two leagues merged. When owned by the DeBartolo / York families, the 49ers became known for having one of the NFL's greatest dynasties, winning five Super Bowl championships in just 14 years, between 1981 and 1994, with four of those championships in the 1980s. The Super Bowl teams were led by Hall of Famers Joe Montana, Jerry Rice, Ronnie Lott, Steve Young, and coach Bill Walsh. With five Super Bowl wins, the 49ers are tied with the Dallas Cowboys for the second-most Super Bowl wins. The name "49ers" comes from the name given to the gold prospectors who arrived in Northern California around 1849 during the California Gold Rush. The name was suggested to reflect the voyagers who had rushed the West for gold. It is the only name the team has ever had and San Francisco is the only city in which it has resided. The team is legally and corporately registered as the San Francisco Forty Niners, Ltd., and is the oldest major professional sports team in California. Major League Baseball teams did not arrive for a few more years when the New York Giants and Brooklyn Dodgers moved to San Francisco and Los Angeles, respectively. The Philadelphia Warriors and Minneapolis Lakers moved to California in the 1960s, and the Oakland Seals and Los Angeles Kings became the first NHL teams in the state in 1967. The Cleveland Rams arrived in Los Angeles in 1946. The 49ers and Los Angeles Rams were cross-state rivals until 1994, when the present St. Louis Rams left Southern California.